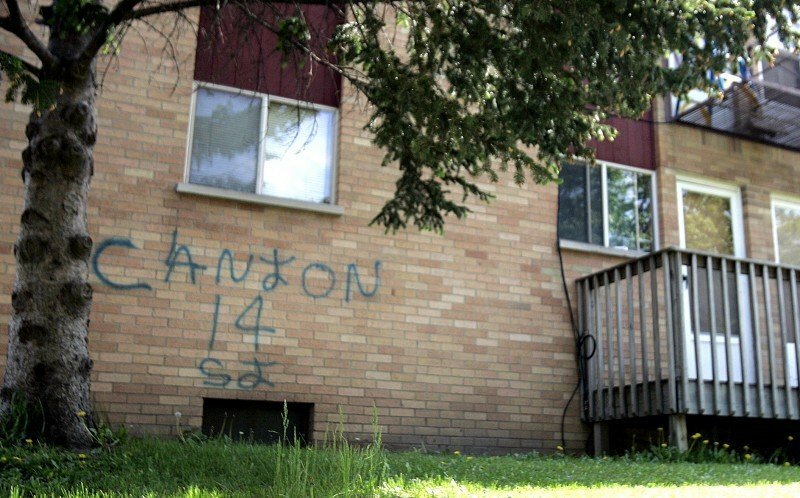 Graffiti referencing the C14 gang is displayed on an apartment complex on Lovell Lane in Madison earlier this month. Police said Antonio Perez, the victim in an April gang-related shooting, was a member of the Clanton 14, or C14, gang. Madison police recovered two rifles, two shotguns and ammunition during a search of 1722 Baird St. in Madison on April 30. Two suspects in a gang-related shooting lived at the residence. Madison Police Officers Matthew Kenny, at left atop Zander, and Katherine Cherne, atop Artex, patrol Warner Park on Friday evening. Police have been investigating whether a stabbing in the park last week was gang-related. Nearly three years after a Dane County task force called for a coordinated effort to combat growing gang activity and six weeks after a gang-related homicide, the Madison Police Department will launch an expanded gang unit that has been in the works since last year. But still lacking is a countywide gang prevention coordinator that Chief Noble Wray said is critical to addressing gang activity, including a rise in Latino gangs, which police say were involved in the April 28 shooting death of a 19-year-old Madison man. "Our emphasis should be on how do we stop the homicide, not what do we do after the homicide," said Wray, who vowed to renew the call for a countywide gang prevention coordinator when the department introduces its new Crime Prevention Gang Unit on June 10 to representatives of community agencies and others working on issues involving gangs and youth violence. But both county and city officials say it's not their sole responsibility to create such a position. Meanwhile, in Madison, the police department will triple the size of its gang unit, from two members to six, starting June 14. The expansion will put one gang-prevention officer in each of its five districts. Sgt. Amy Schwartz, currently with the department's Criminal Intelligence Section, also will be part of the unit. The gang officers will work closely with other officers in their districts and with police serving as educational resource officers in the city's high schools, as well as with community members, to keep youths from getting involved in gangs, Wray said. Joel Plant, an aide to Mayor Dave Cieslewicz, said the new crime prevention gang unit already is drawing attention from other U.S. law enforcement agencies for its combined focus and its placement of gang officers in districts throughout the city. Lt. Brian Ackeret of the North District, where the April homicide took place, said the new gang unit "will be a welcome additional resource that's definitely needed, and the timing is perfect." In the wake of the death of Antonio Perez, the victim in the April shooting whom police identified as a member of the C14 gang, police said they feared retaliation. So far, that hasn't happened. Police have said most of the group involved in the shooting belongs to the South Side Carnales, though court records also suggest some or all were members of MS-13. On Friday, police on horses patrolled Warner Park, where last week a 22-year-old man was stabbed after a fight on the basketball court and two days later shots were fired. Police were investigating whether those incidents, as well as two after-school disturbances last week involving students at Metro Transit's North Transfer Point, were gang-related. But Wray and others say a countywide coordinator is also essential to keeping efforts by police, schools, social services agencies and community organizations to combat gang issues on track. The Dane County Enhanced Youth Gang Prevention Task Force recommended in August 2007 that a countywide gang coordinator's position be considered. That group's co-chairman, former Madison police Capt. Luis Yudice, who's also security coordinator for the Madison School District, first called for a "comprehensive strategy so we can all work in unison" to address gang violence in September 2005. "We have gang-involved kids in probably most of our high schools and middle schools and some of our elementary schools," he said. Staff do a good job of keeping gang activity out of the schools, he said, and work closely with students, families, police and social workers in an effort to keep students out of gangs. Locally, the gang issue is not unique to Madison schools. "We're seeing more gang activity in the suburban school districts," Yudice said, as well as the emergence of hate groups targeting blacks and Latinos in Madison, Deerfield, Cottage Grove and DeForest. Ivan Mateo-Lozenzo, a 21-year-old illegal immigrant from Veracruz, Mexico, who police say killed Perez, was enrolled as a junior at Middleton High School, where officials knew him as Arain Gutierrez, 18, and believed he had previously attended Madison's West High School. Madison School District officials, citing federal privacy laws and district policy, have refused to say whether Mateo-Lozenzo, who is still at large, had been enrolled there. But they said they shared information with police after the homicide. Four others charged had attended schools in Madison or Verona. Yudice said he had hoped a county gang coordinator would be created "to keep this issue on the front burner" and avoid duplication of services among the many entities working to address the gang issue. Had such a position been in place, Yudice said, he believes some of the increase in the county's gang activity might have been prevented. County Human Services Director Lynn Green said in an e-mail that the task force was a joint effort by the city and county, and its recommendation doesn't indicate that the county "should be the entity to consider creating this position." The county already spends over $16.7 million on gang prevention, intervention and enforcement efforts, and has committed the time of Delinquency Services Manager Stephen Blue "to the daily duties of the coordinator role," Green said. Green said in an e-mail that after the shooting, Falk named Frank Rodriguez as a "program leader" with the neighborhood program to work with Latino youth. Plant said the city agrees that a countywide coordinator is vital to the efforts to combat gang activity. "I think that the mayor would welcome a conversation with (County Executive Kathleen Falk) about this position and how it might be funded," Plant said. "At this point, that conversation hasn't happened." State Journal reporter Gena Kittner contributed to this story. Officer Lester Moore, who has worked with the Madison Police Department's gang unit since 2008, will remain with the unit as the East District gang specialist. 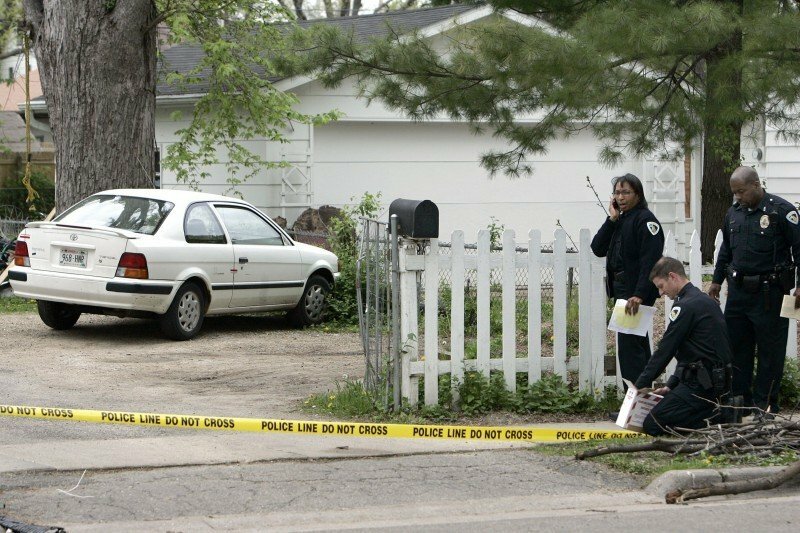 A man arrested last month by Madison police, who said he was an "upper-level" member of the Clanton-14, or C-14, street gang that was planning to retaliate for the April slaying of gang member Antonio Perez, was charged Wednesday in federal court with illegally re-entering the country after being deported.